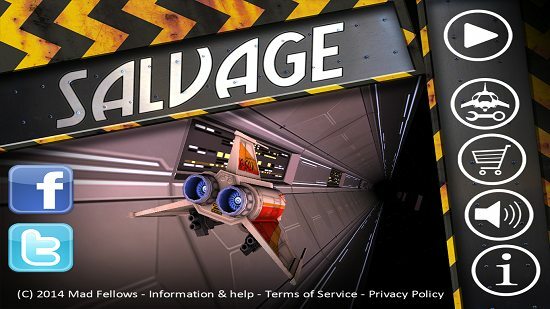 Salvage is a free game for Windows 8/8.1 devices that allows you to control a spaceship to the music playing in the background. 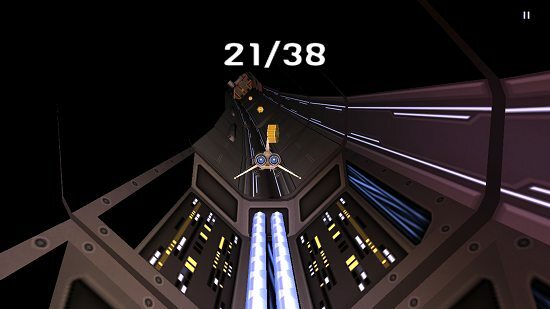 In the game, you have to pilot a spaceship that is moving through a vortex and collect as many coins as possible on the way. The controls are easy; all you have to do is to swipe to the sides of the screen to move the spaceship and collect coins. You also have to avoid obstacles on the way, and if you lose the beat of the music, it’s game over. So overall, it’s pretty gripping with a twist, that makes you stay on the beat. Salvage has very smooth graphics, and the background score is incredibly gripping. The background score is actually a dubstep music track. Salvage can be downloaded for free from the Windows App Store. Salvage, when launched on your device, will present you with an interface which looks like the below screenshot. The above screen is the menu of the game. You can choose to play the game by clicking on the Play button in the top right. Once the game starts, you will be presented with the gameplay screen itself, which looks like the below screenshot. Here, you can see the ship flying through the vortex tunnel, and you can see that I am collecting coins throughout the way. You can slide your finger to the sides, top, bottom, top left, top right, bottom left or bottom right to move the ship in those positions respectively. If you don’t have a touch screen device, you can use the mouse pointer and click and drag to mimic the same actions. Oh, and the background music is a dubstep track that plays in accordance with the coins that you are collecting. Miss a coin, and the music goes haywire and it’s game over. This is a pretty cool concept that not only allows you to stay entertained for long hours, but also allows you to have a knack for music! 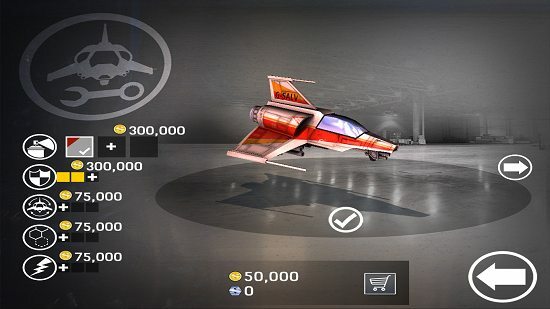 Coming back to the main menu, there is also an option that allows you to upgrade your space ship, buy new space ships, etc. Basically it is the game shop. This can be accessed by pressing the second button from top in the right side of the screen in the main menu. (see the spanner button with the spaceship icon). Once clicked, you will be taken to the shop. You can buy upgrades for health, etc. in this shop. You can also buy new space ships that you unlock along the way. 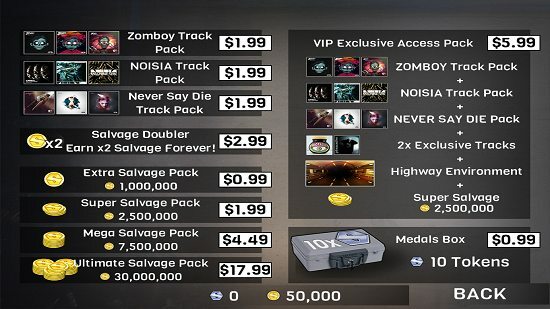 The purchases can be made by using the coins that you accumulate during the gameplay. It takes a long time to collect these coins, and if you are lazy, you might want to give the coins collection a pass and you can buy the coin packs by clicking on the cart icon in the main screen of the game. As you can see, these cost real money. So if you are like me and like gaming, you will love to earn these salvage coins the hard way by constant hours of gaming, I’m sure, as that’s fun and on top of that, it doesn’t cost you any money as well! Overall, this is pretty much all that you need to know to get started with playing Salvage on your Windows 8/8.1 device. I do hope that you like the game! Salvage is a great game that has smooth graphics and makes for a fun game to play in your free time! The graphics are smooth, and coupled with the smooth movement and amazing dubstep background track, the game is truly a treat to the senses! I am in love with the game, and the only complaint that I have with this game is that it isn’t quite optimized for non touch devices, although you can still use your mouse to mimic the touch screen gestures. This game truly deserves a 4.5 out of 5!